Rendering of the BRG Center for Health. Baton Rouge General Hospital has begun a $12 million renovation and expansion of a 140,000-square-foot building on its Bluebonnet Boulevard campus that was formerly occupied by Ochsner Health System. 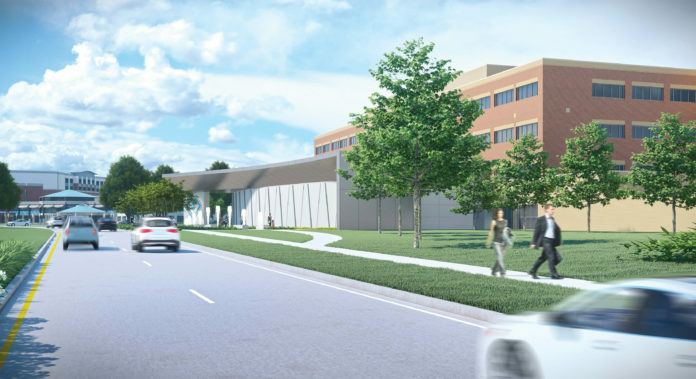 When completed in 2020, the facility, which will be expanded by nearly 12,000-square-feet, will be called the Baton Rouge General Center for Health and include a six-suite outpatient surgery center. It will also house physician offices, clinic space, outpatient rehab services and BRG’s graduate medical education programs. The project will also revamp the look and feel of the entrance to the Bluebonnet campus. Currently, the office building, located at the intersection of Bluebonnet and Picardy Avenue, is mostly obscured by trees. But the foliage will be cleared to make way for the addition to the building, which will have a sleek, contemporary design. Ochsner announced in 2017 it would be relocating from the building on the BRG campus, which had opened in 1996, to a new 210,00-square-foot clinic fronting Interstate 10 on a nearby 16-acre tract at The Grove. The clinic opened earlier this year. A micro hospital on the site will open later this spring. BRG, meanwhile, has been planning to expand into the building. It said at the time of Ochsner’s announced departure it was terminating the hospital’s lease because it needed the space to grow. BRG’s planned outpatient surgery center is the latest of several health care construction projects to be announced or completed in an increasingly competitive and crowded market. In January, BRG broke ground on a 10-patient hospital and clinic in Prairieville. Ochsner is expanding at its Satsuma facility in addition to the work at The Grove. Our Lady of the Lake is continuing construction on a $230-million Children’s Hospital.